I haven’t been to Zuccotti Park but I didn’t meet any protesters outside St Paul’s who want to be ‘told what to do, as well as think’, exactly. 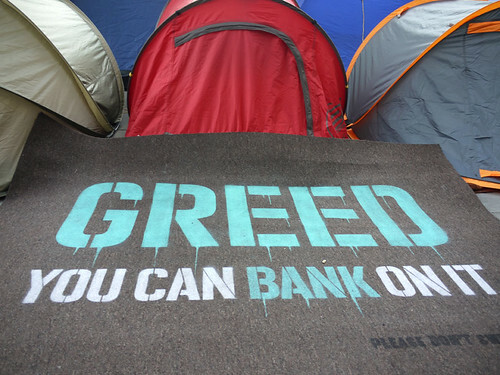 Still, the talks and films in the Occupy LSX ‘Tent City University’ are well attended. Let’s assume for a moment that reviewer was right: what ‘thing or three’, then, might Goodman have told the protesters in New York or in London? He traced the development of this ‘double-talk democracy’ back to a betrayal of the original American idea. That idea had been authentic self-government for American people, as understood from the beginning by Thomas Jefferson. The same idea – and who was included in the term ‘American people’ – would be updated by Abraham Lincoln a century later, then once again a century after that, by Martin Luther King. Goodman always insisted, to the infuriation of his fellow-radicals, that he was an ‘American patriot’. The America he remained loyal to was that project of thorough-going liberation, through participatory democracy, with which it began. ‘My own persisting opinion,’ he wrote, ‘is that the only remedy for anomie is to give people more power to act effectively, and so to recreate morale and develop morals. This means at present to build into technology, urbanism, communications, politics, education a strong admixture of decentral organization, in which people can initiate, decide, and co-operate.’ His preferred economics were, accordingly, those of Adam Smith in their pure form, with their ideal companies ‘competing in a free market without monopoly’. It was called anarchic in its time, because it offered ‘a model of decentralist co-ordination, as opposed to the centralized system of mercantilism, royal patents, and monopolies it replaced’. The modern US, with its ‘baronial corporations’ and advertising and war economy, was to Goodman a disastrous abandonment of that original idea. This had, and has, consequences – as that protester I began with saw so clearly – which run from the most elementary economic questions through to the psychological well-being of every one of us. In the rebelliousness of the young, Goodman thought he detected an awareness of this larger historic betrayal. I’m reminded of a conversation I had with a protester helping to set up the power supply for the camp outside St Paul’s. An electrical engineer, what interested him about Occupy LSX was less its discussions about economics, though he had participated in those. He saw the camp primarily as an opportunity to connect small green businesses (say, providers of solar-powered lighting systems) with the sort of investors at whose doorsteps they are now camped. Occupy London protest. Photo by Alan Denney under a CC Licence. That steely note of realism about how to actually effect change isn’t everywhere outside St Paul’s but then it doesn’t need to be everywhere – the camp is serving many different purposes. It is important though. As we’ve seen, Goodman talked up decentralizing at any and every opportunity, but he also realized, having studied and written at length about urban planning, that you can’t decentralize everything. Air-traffic control? Urban water supply? Efforts to control pollution? All of these work best on a scale which requires centralized planning. Food production, education, culture, scientific invention and most kinds of business – these, by contrast, for Goodman, were much better left to relatively small self-organizing groups. But how to get a sensible discussion about the right mix? The official conversation isn’t working any better now than it was then. ‘It cannot be denied that our dominant society is unusually inauthentic. Newspeak and double-talk are the lingua franca of administrators, politicians, advertisers, and mass media. Such people are not even lying; rather, there is an unbridgeable divide between the statements made for administrative reasons or the image of the corporation and what is intended and actually performed.’ That ‘unbridgeable divide’, between what governments and corporations say and what they actually intend and then do, has been re-discovered the hard way by a new generation. The camp’s attempt to weld the saying and the meaning back together again has proved very popular. Perhaps we shouldn’t be so surprised. They have certainly chosen the right spot for this discussion. The London Stock Exchange is housed in a relatively unassuming office block situated, as all the world is now aware, immediately next to St Paul’s Cathedral. When Paternoster Square was closed to the protesters in mid-October, it was on the grounds that public access to the square had been revoked by the square’s ‘owner’. You might assume that owner, given the City’s antiquity, to be some duke or other, but it is the Mitsubishi Corporation – and the square in its present form has only existed since 2003. At its centre stands a tall classical column set on a high platform. It has something like a large gilded pineapple at the top, from which item of tropical fruit rise large gilded flames. This column dates from 2008 and people have naturally sought to read some meaning into this focal point of the square. The architect, William Whitfield, has insisted that it isn’t a monument to anything – no historical reference is intended. The unusually high platform actually serves to conceal the ventilation shaft for a service road which runs beneath it. To build a square at the highest point of the City of London – an area continuously occupied for more than 2,000 years – and place at its centre a monument to absolutely nothing shows real determination. I hereby offer my own interpretation of that column: it is a suitably gilded monument to 2008 and wilful amnesia. This hill-top fairly teems with the memory of arguments past about what it means to be a human being. Some of them might surely play a part in the current discussion. Goodman mobilized the original purpose of the American Revolution for the purposes of his own decade. But he also came to feel that the crisis of legitimacy, in particular the nascent environmental movement, represented a wider shift in attitudes, or a ‘New Reformation’. ‘The times are like 1510,’ he wrote in what would be his last book. That analogy feels as if it is making a comeback around Paternoster Square at the moment. As well it might. A Dean of St Paul’s, the great Renaissance scholar John Colet, was summoned here in 1512, by King Henry VIII, to address the Bishops on how the Lollard heretics should be suppressed. The Lollards were a loose religious grouping, highly critical of the church’s wealth and hierarchical nature. Expected to denounce them, Colet instead delivered a stinging rebuke to the materialism, greed and ambition of the Bishops, and for good measure went on to criticize the King’s war-mongering foreign policy. While we’re on the subject of islands, Daniel Defoe’s Robinson Crusoe was first published in a building where Paternoster Square now stands. And it was Defoe, again, in a book about his travels around Britain, who noted that the architect of St Paul’s, Sir Christopher Wren, originally wanted to build his great cathedral roughly where the Stock Exchange is now. He was prevented by vested interests. There could not, in short, be a better way, or a better place, than General Assemblies on the steps of St Paul’s for our current re-think. 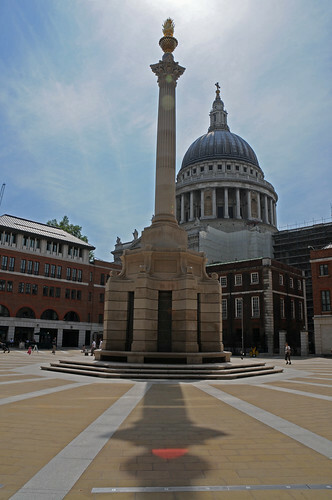 Paternoster Square can opt for amnesia and meaningless pomposity: we are not obliged to follow suit. And neither, obviously, are we obliged to restrict ourselves to any particular precedent. Activists from Cairo have given talks. There have been the link-ups with Syria. I had a fascinating conversation with a young British Asian writer at the book table about how India’s constitution was drawn up in 1947. How these protests will be interpreted, and what they will achieve, is entirely up to whoever wishes to participate. Paul Goodman enriched the discussion of his own day by bringing to it a carefully thought out version of how human beings and their communities actually function best. The TV and the newspapers and the politicians can and no doubt will make of Occupy LSX whatever they wish. That’s their own business. Horatio Morpurgo’s most recent book, Lady Chatterley’s Defendant & Other Awkward Customers (Just Press) includes a more general introduction to Paul Goodman’s thought, ‘Unblocking the Future’.